The idea here is to build authority posts or pages on your blog by regularly updating the content with relevant and current information. Not every post has to be an authority page, this would be for ever changing topics that are popular among your readers and will serve them better. The main point in updating posts you consider important is to provide the best possible solution for your readers. An added benefit to these pages, if done properly and visits increase, is Google may update your post in the search engine results pages and possibly consider it a more authoritative article. NOTE (September 8th, 2014): The video and page seen here was back in February 2013 when we were just getting started in Google Hangouts (HOA) so it’s a little rough. My audio quality was less than ideal and I wasn’t comfortable on camera BUT I am positive that the content and strategy was spot-on and I’ve since experienced the benefit of creating authority posts with regular updates right here on Hot Blog Tips. At the time of this update, our homepage has a browser Google PageRank (unreliable) of 03 while we have internal posts that rank high in the SERPs that show PageRanks of 04 and even 05. The PageRank in itself wouldn’t be reliable evidence that the strategy is effective but the results of consistent Google referrals is. What we’re talking about here IS NOT blog post maintenance; it’s a different way of thinking when it comes to creating certain content. Again, this IS NOT for every post we write and not for every older post on our blogs. When writing about a relevant topic that will certainly change, we write that post with the intent of creating an authoritative and up to date resource for our readers, visitors and blog subscribers. IF you are looking for a post on updating old posts in the form of blog maintenance and cleanup, you can find that at Digging In Deep Updating Old Blog Posts For User Experience And SEO (14 Sep 2014). Back on Jan 27, 2013 I covered this topic in a Hangout (Embedded below) with the Hot Blog Tips Hangout Crew and for this week’s Quick Blogging Tip Thursday, I wanted to address it here on Hot Blog Tips. In the video below, I used WordPress SEO by Yoast as an example. That page is many years old but is updated on regular bases and has a lot of authority. As you can see, from the image above, Google shows the date the post was updated, not when it was originally published. UPDATE to Yoast’s update: As of September 14th, 2014, the example authority page I use has been updated September 8th, 2014. As you can see, Yoast has been very consistent in these quality updates. I practice what I preach and sometimes it pays off. I’m posting this update on Oct. 25, 2015. I have several examples over the last two and a half years but I’ll share the most recent – New Top Level Domains List – New gTLDs, originally published June 22, 2014. New Generic Top Level Domains are coming on line all of the time and a post like that requires regular updates. By Re-Publishing the updated content, Google (if the content is worthy) considers updating the search results with the newer date. Originally published June 22, 2014. Google included the updated re-publish date of Oct. 2, 2015 in their search results. Important Note: By no means does this mean all blog posts should be updated regularly, much less re-published. However, creating authority pages that require regular updates may benefit from taking the extra step of republishing the post so Google and the other search engines can see that it is current, relevant, and updated. Notice this vary post has been updated several times over the last couple of years yet I did not “re-publish” with a new date. Do you think other websites will be more likely to link to a post that they feel will be updated? 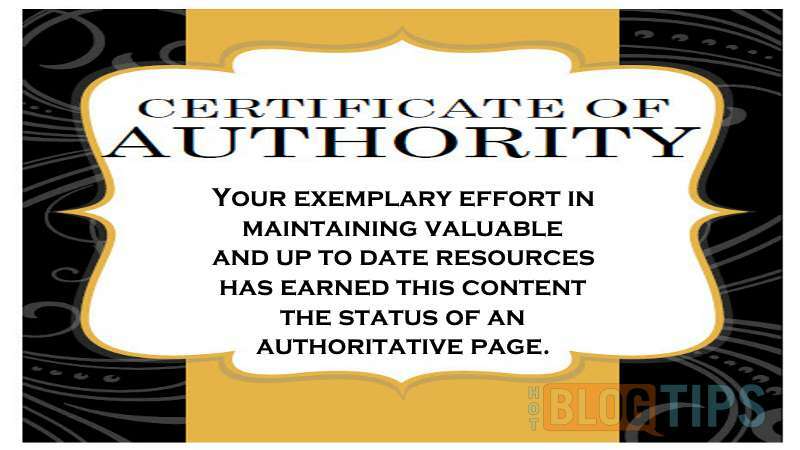 Do you think authority posts are important? Do you have any other examples? Feel free to comment below, that’s why we’re here.